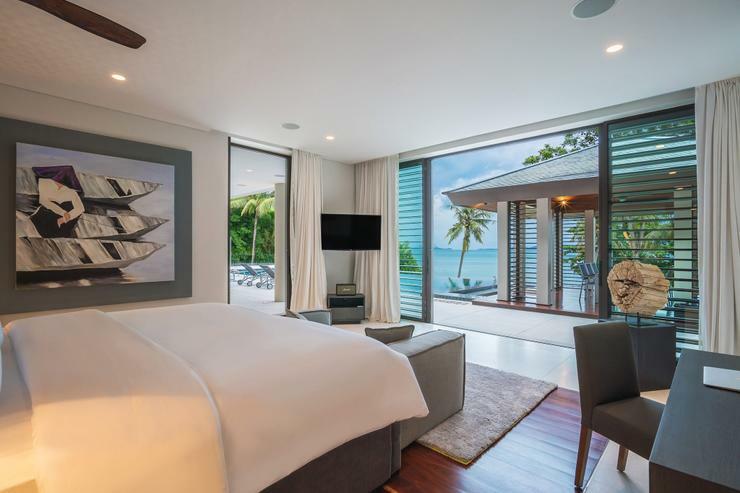 promotion: Promotion: Enjoy 20% off with inclusions, when you stay anytime from now until 30th April 2019. 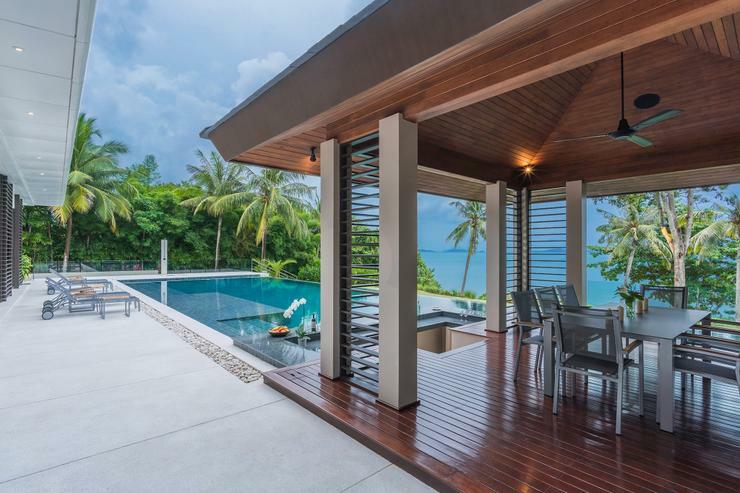 Tastefully balancing contemporary design with modern Thai architecture, Naam Sawan in the exclusive Cape Yamu Estate, is a luxurious seaside haven suitable for families and friends on holiday. 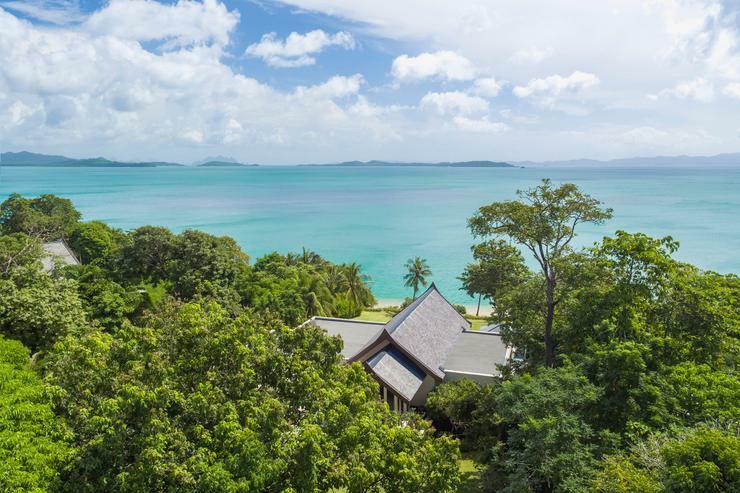 Located on what is considered one of Phuket’s most unspoilt peninsulas, it offers stunning panoramic views of Phang Nga Bay in the Andaman Sea, and is surrounded by rolling emerald hills blanketed by lush tropical landscape. 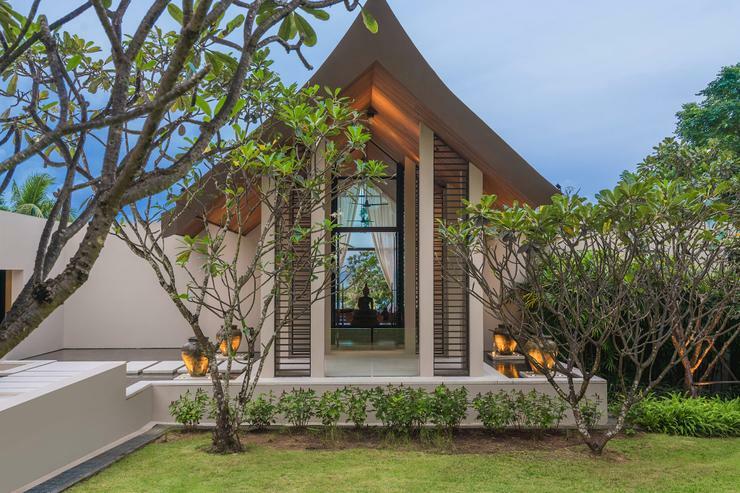 A product of world-renowned architectural design team, Philippe Starck and Jean-Michel Gathy, Naam Sawan seamlessly blends indoor and outdoor living spaces to create a refreshing ambiance that is light and exalting. 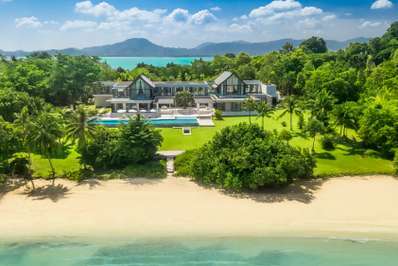 It boasts an expansive living and dining room with a high vaulted ceiling, four lavishly furnished ensuite bedrooms dressed in designer chic décor, and an outdoor pool area that is brimming with luxury. 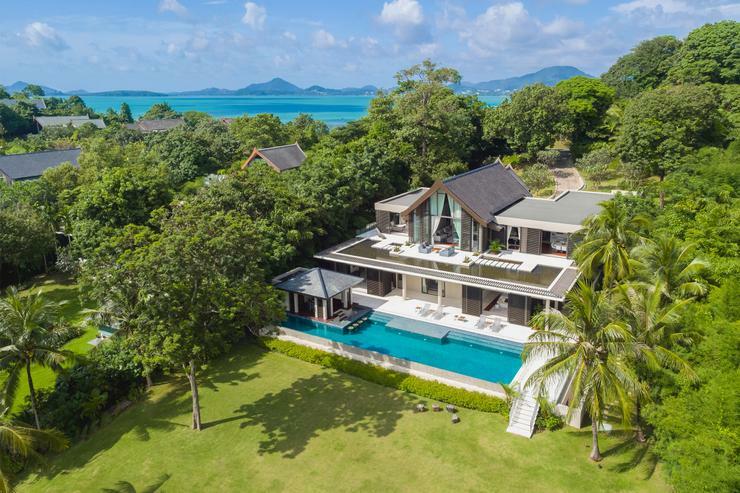 The villa is brought to life each day with spectacular sunrises over the jagged, majestic cliffs in Phang Nga Bay. 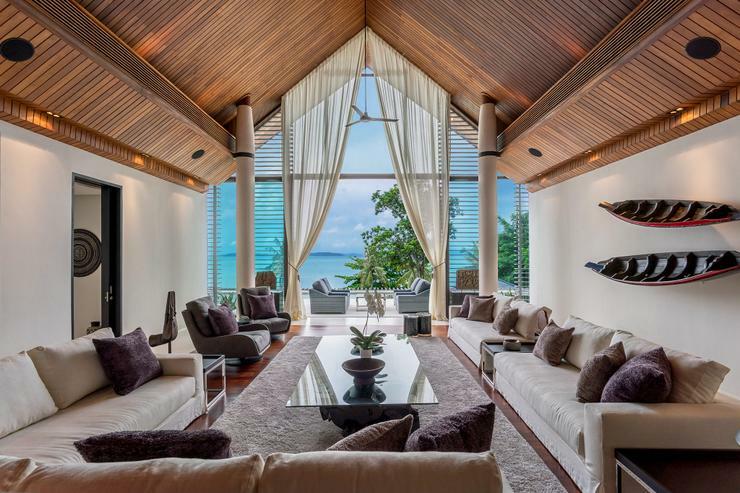 Included are an impressive array of facilities to make one’s stay pleasant and relaxing. 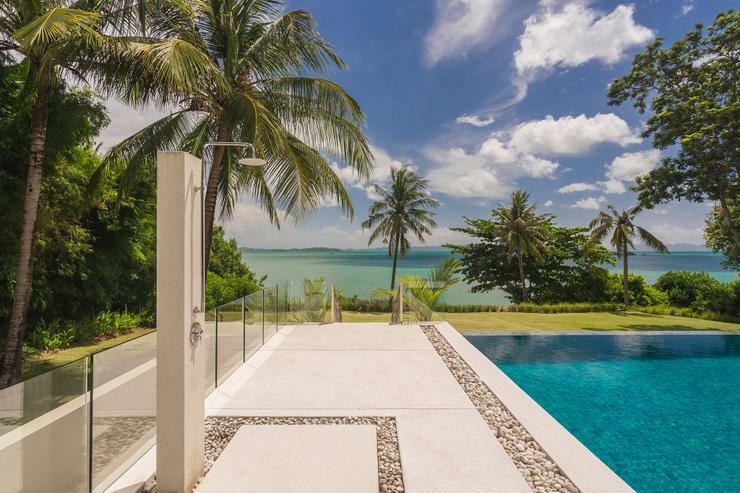 Indoor entertainment is provided by a home cinema with 65-inch flat-screen TV, blackout curtains and SONOS integrated sound system, while table tennis, the blissful 30-metre pool and lush gardens add to outdoor delights. 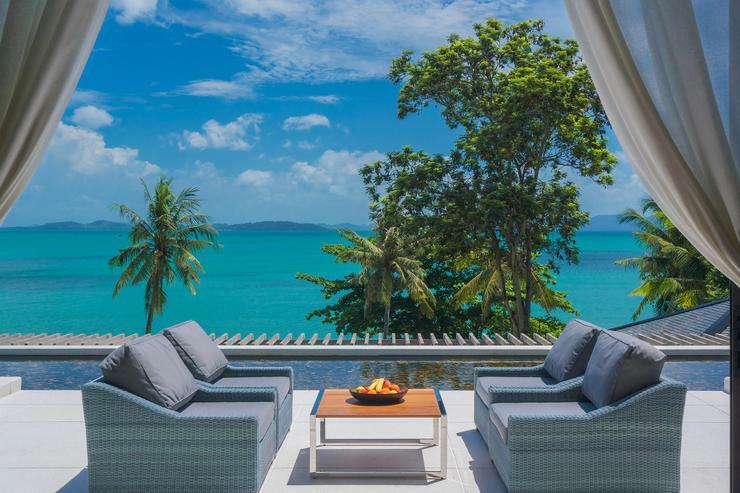 Beyond the villa, guests can enjoy strolls along the quiet beach; and for a nominal fee, access to exclusive five-star sport, wellness and dining facilities at the nearby COMO Point Yamu resort, or visit the neighbouring islands of Phang Nga Bay with their dramatic limestone cliffs and pristine white sand beaches. 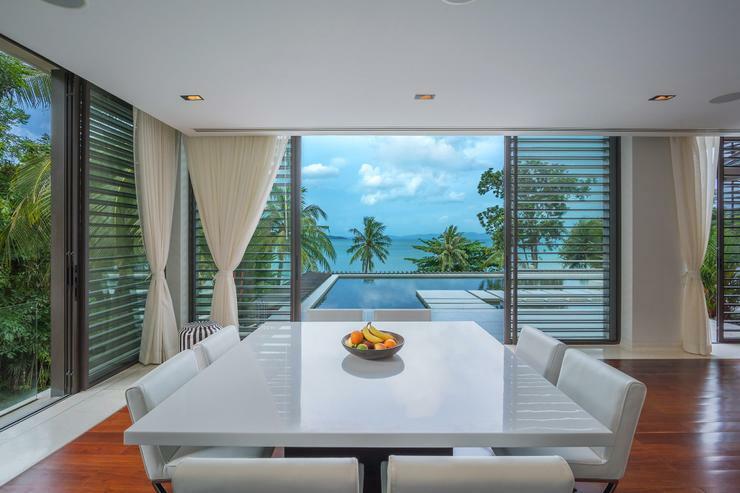 Shoppers and gourmets, will find the boutiques, cafés and restaurants of Phuket town just half an hour’s drive south. Naam Sawan’s welcoming team of staff epitomise warm Thai hospitality. 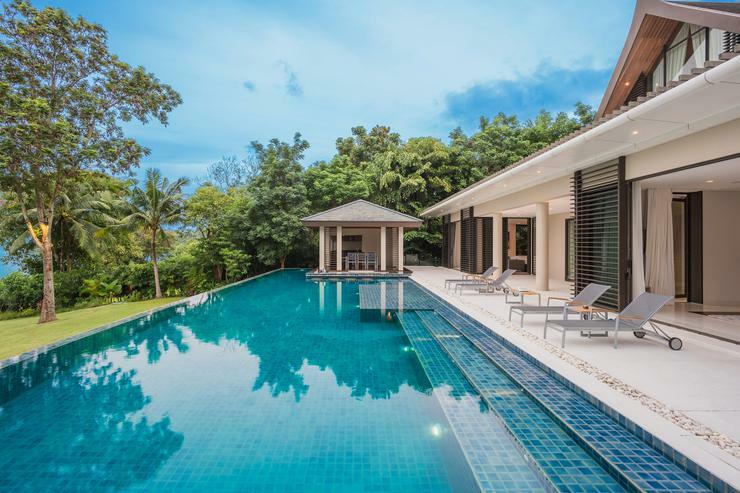 Included is a villa manager, villa attendants and estate security staff, as well as private full-time chef who prepares a range of mouth watering Western and Thai dishes from the villa’s extensive suggestion menu. 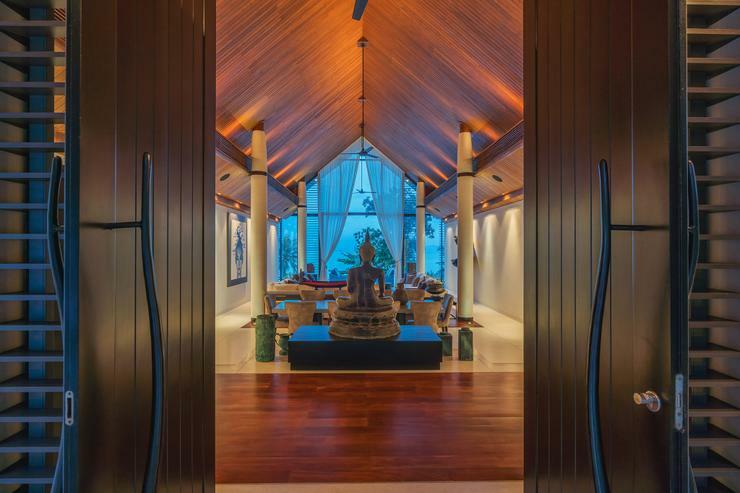 Naam Sawan’s double door entrance opens to an immense living and dining space that spills out onto a sea-view, upper-level terrace overlooking the pool. 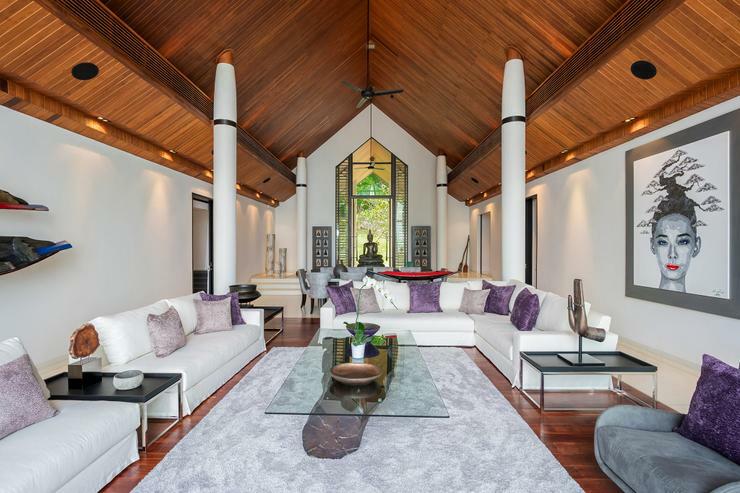 To the left is a Western style guest kitchen and dining area, adjoined by the chef’s kitchen and staff quarters. Opposite the living room is a guest bedroom with terrace access. Downstairs is the master suite, two neighbouring guest rooms and a home cinema. 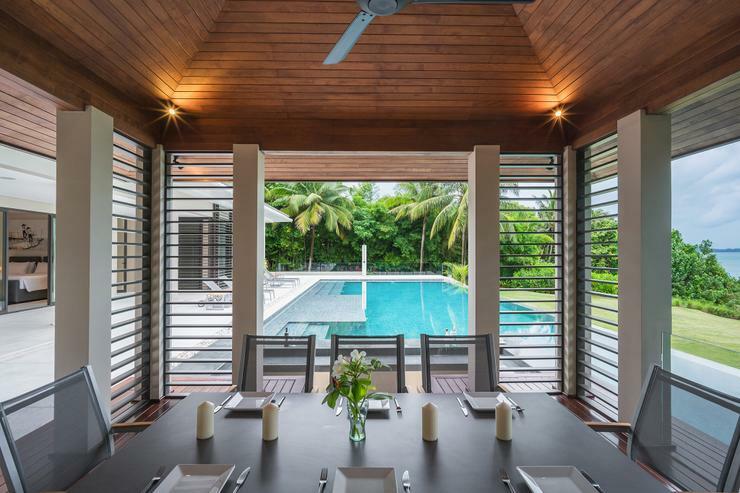 These lower-floor rooms enjoy direct access to the pool deck and its alfresco dining and lounging areas. 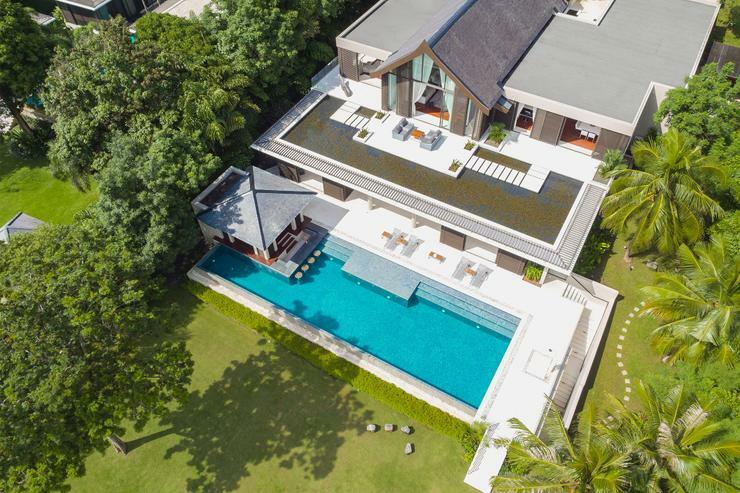 Beyond the 30-metre pool is an immense lawn leading to a private beach. 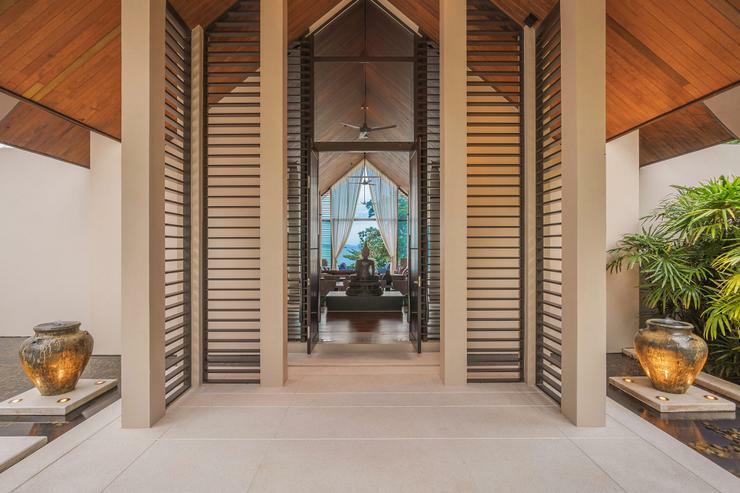 At the centre of villa is a living room of cathedral-like dimensions, where a vaulted timber ceiling supported by stout white columns towers over floors of terrazzo and teak. 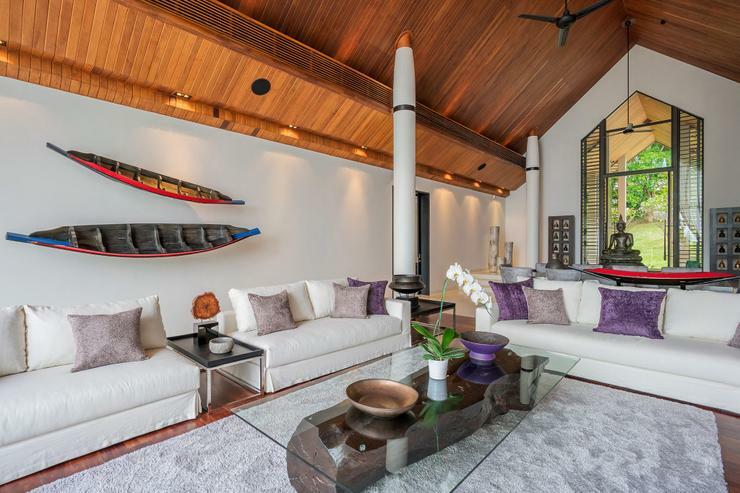 It is furnished with a generous array of plush sofas and armchairs with deep cushions made for sinking into. 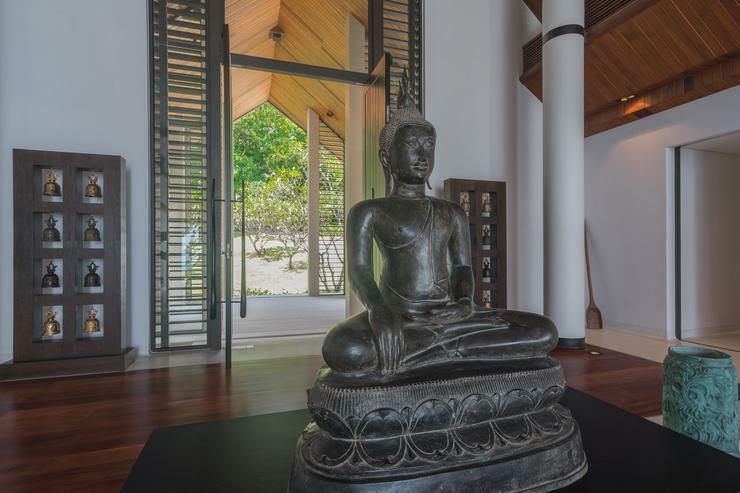 The space is stylishly accented with bronze Buddha sculptures and soft area rugs. 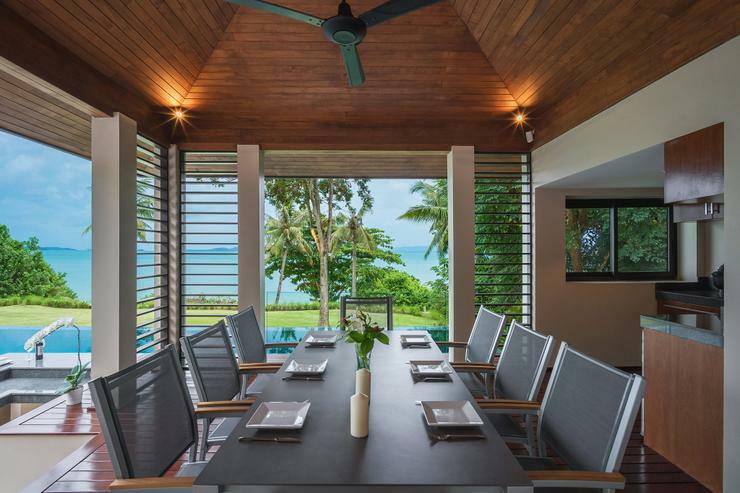 Original artwork from northern Thailand adorns the walls around the large dining table of sleek polished concrete. 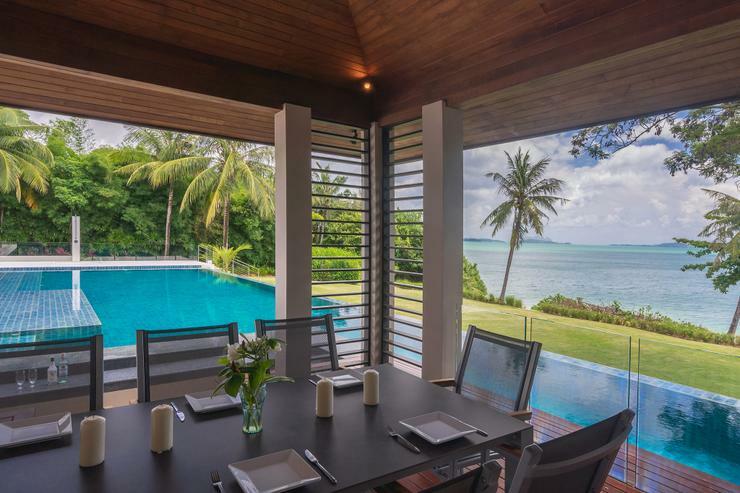 The neighbouring, fully equipped Western style guest kitchen includes bar seating, a wine fridge, 50-inch wall-mounted screen with Apple TV, and a chic dining table with white leather seating. 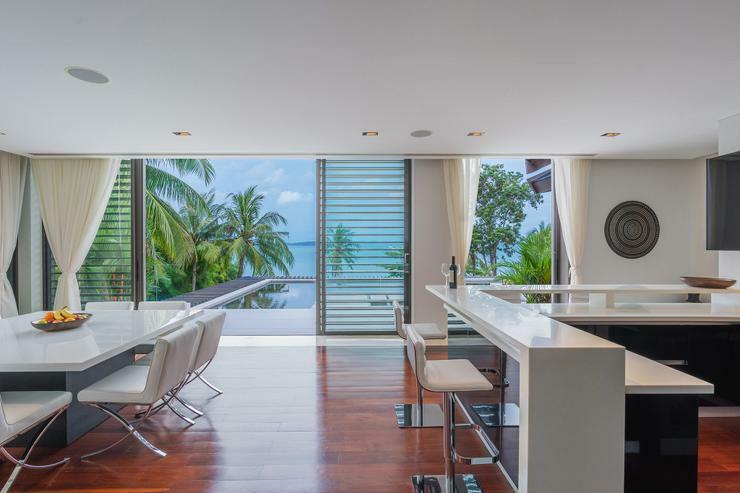 Adjacent is a additional fully equipped kitchen, which includes a granite top island with bar seating. 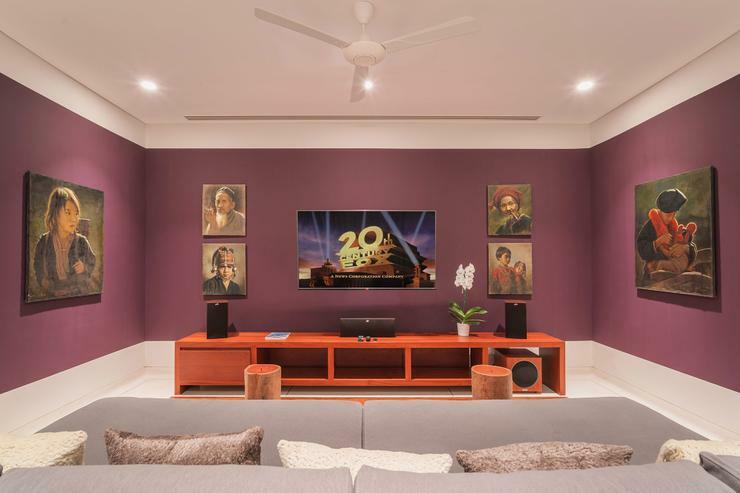 Naam Sawan’s home cinema is the perfect place to unwind with a favourite film. Deep, soft-cushioned sofas and blackout curtains paired with a 65-inch screen and sound system help to create an authentic theatre-going experience. 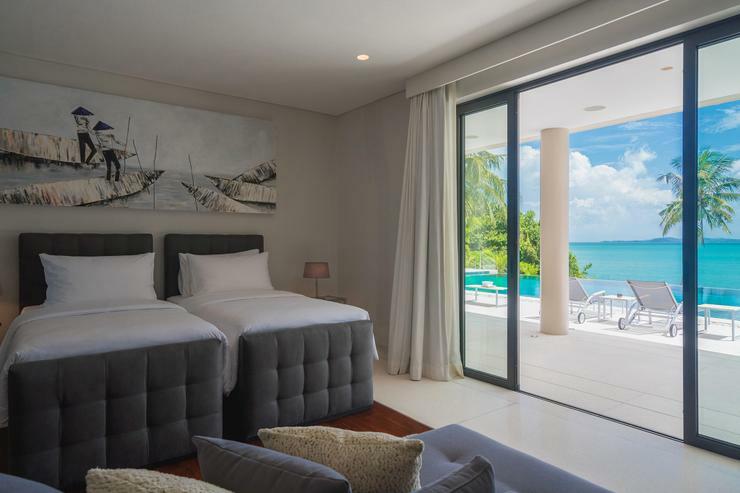 Naam Sawan’s four generously sized ensuite bedrooms are air-conditioned and come with plush mattresses, crisp white lines, built-in wardrobes, soft-cushioned lounge seating and floor-to-ceiling sliding glass doors that open onto a shared veranda with sea views. The rooms are decorated with original artwork and come equipped with a blue tooth speaker and charging station. 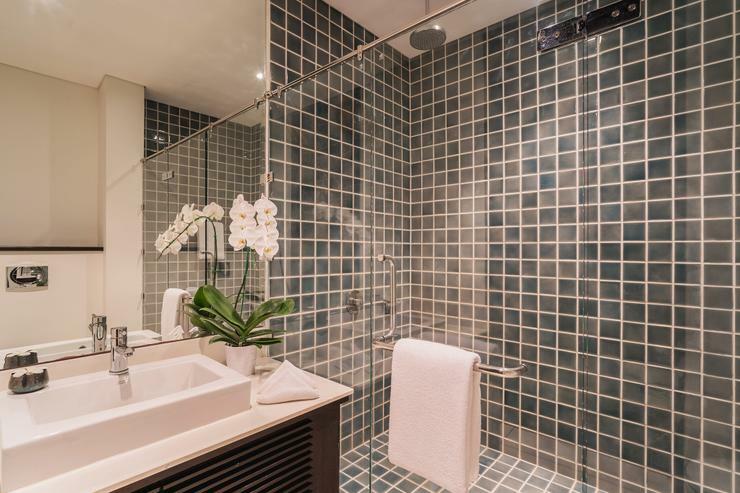 En-suites feature twin sinks, rain showers and large mirrors. 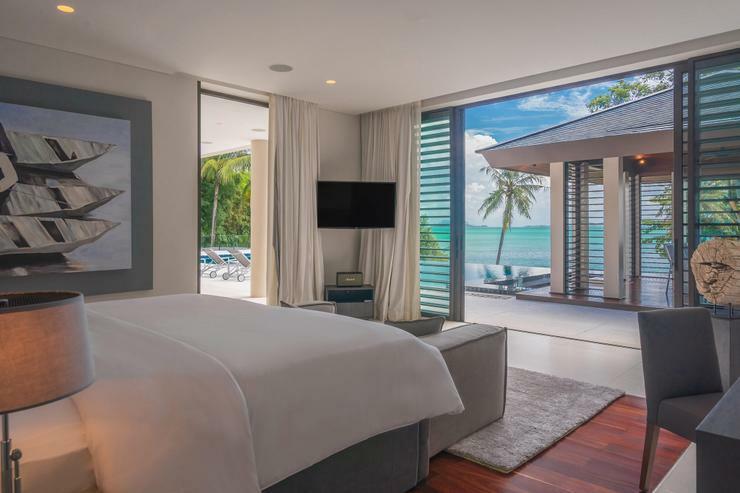 Privately situated on the villa’s lower level, the villa’s master suite is designer-chic, and equipped with a wall-mounted 50-inch TV screen and Marshall speakers. 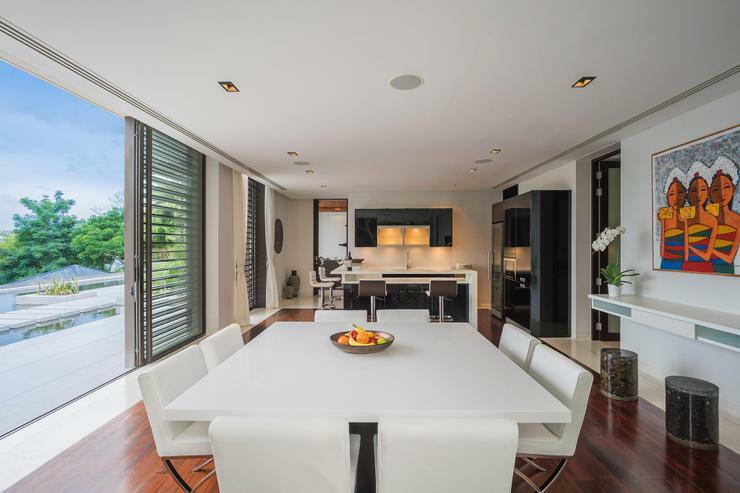 This room is slightly larger than its neighbouring suites and includes a generous dressing area. 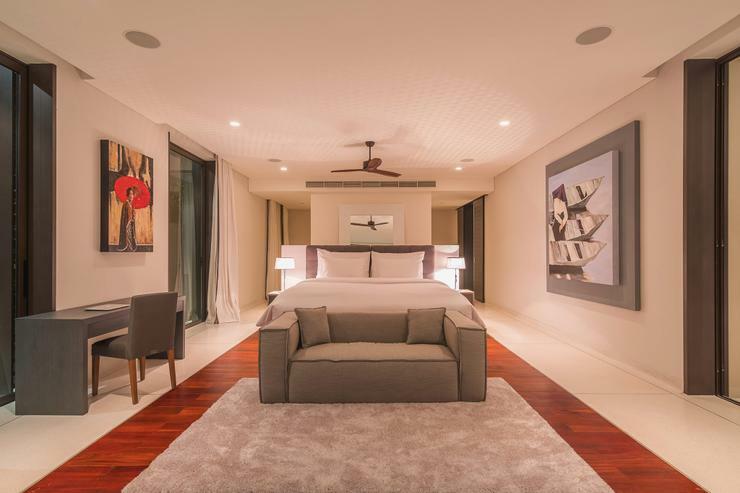 Situated on the upper level of the villa, this guest bedroom is stylishly decorated, furnished with a king-size bed and equipped with a wall-mounted 40-inch TV screen. 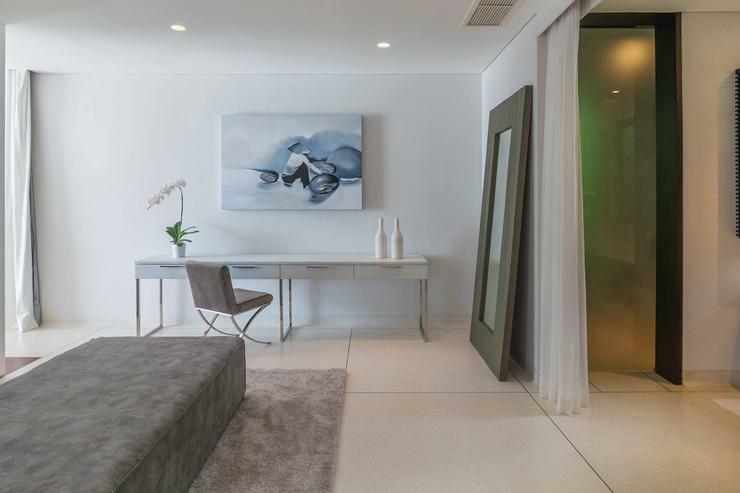 The ensuite and sleeping area are separated by a large built-in wardrobe and large ottoman. 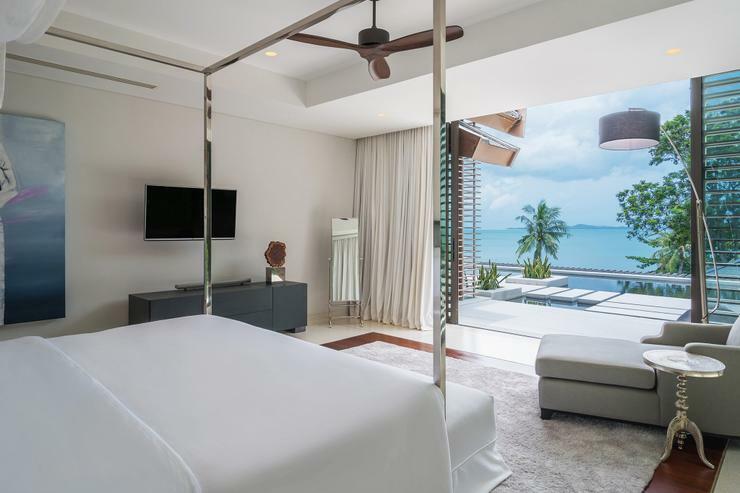 These rooms offer comfortable king beds, one of which can be convertible to twins. Airy and invigorating, they feature a refreshing colour scheme and are furnished with deep-cushioned chaises longues. 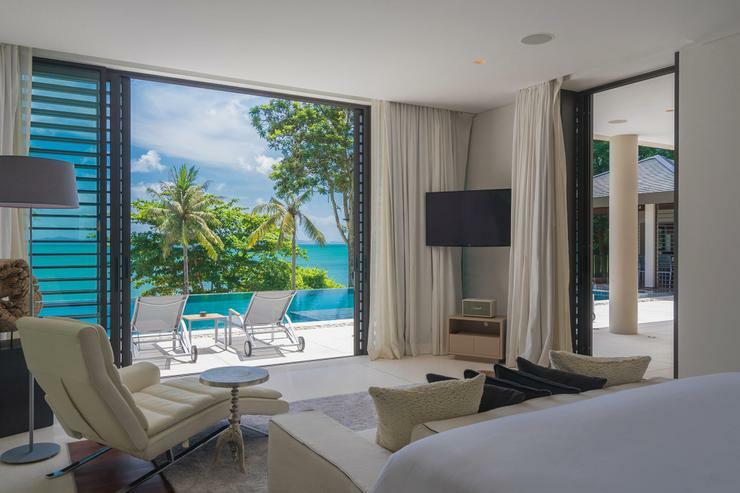 One of the rooms has a 50-inch TV while both enjoy easy access to the home cinema for late-night movie extravaganzas. 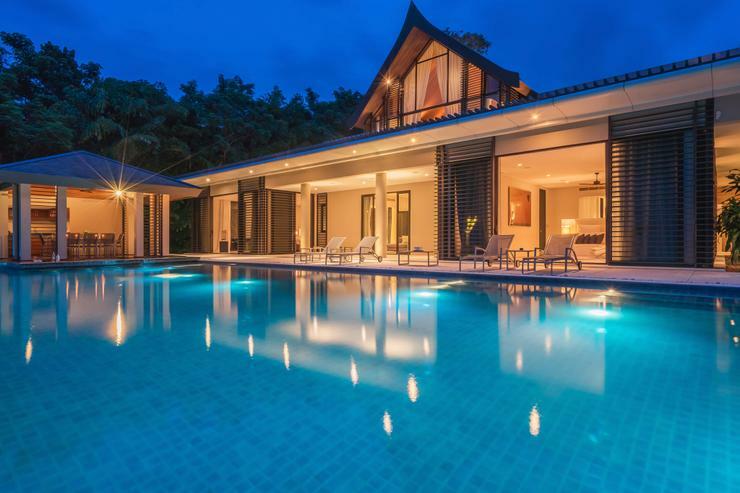 Located in Cape Yamu, Phuket. 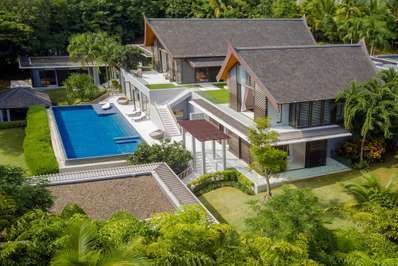 Villa Verai is a in Thailand. 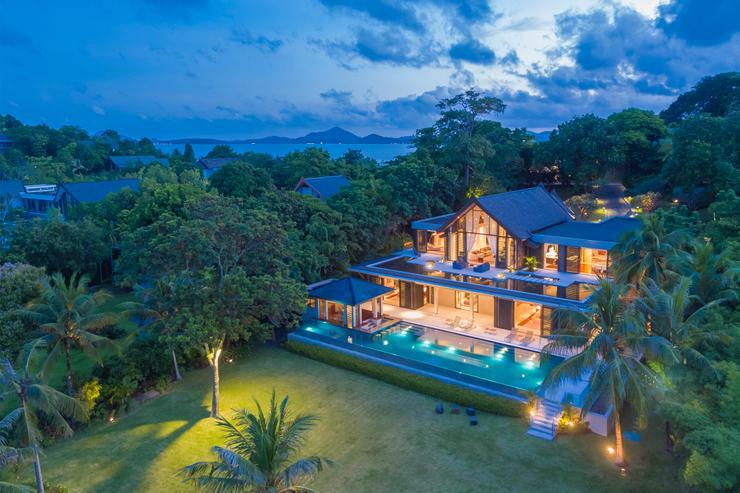 Located in Cape Yamu, Phuket. 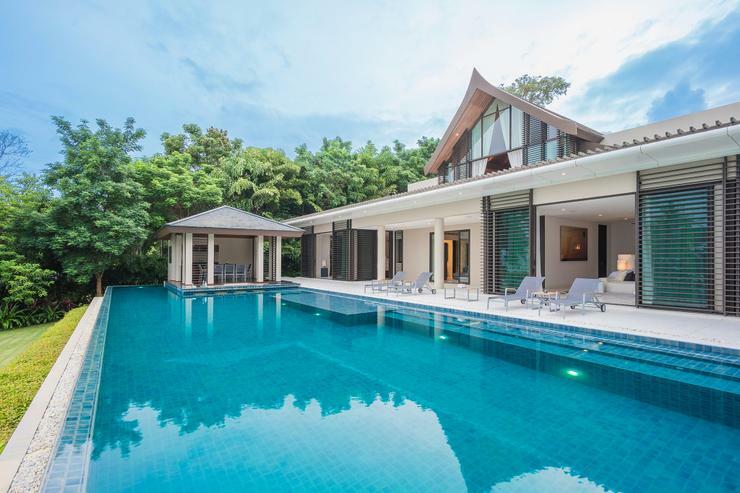 Villa Sawarin is a in Thailand. 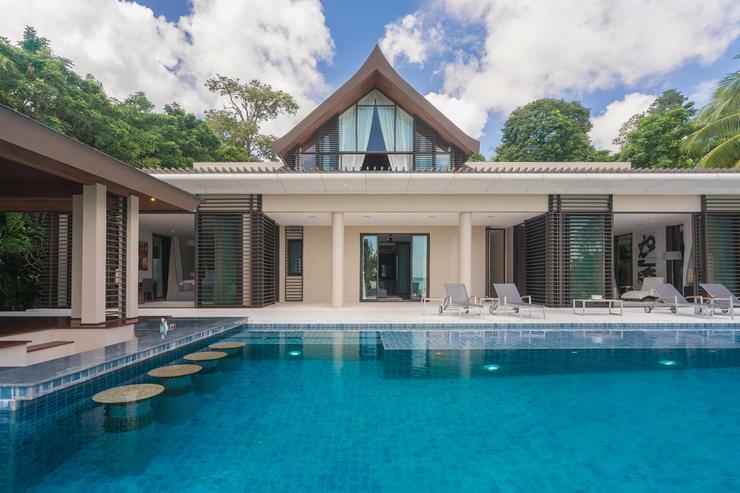 Located in Cape Yamu, Phuket. 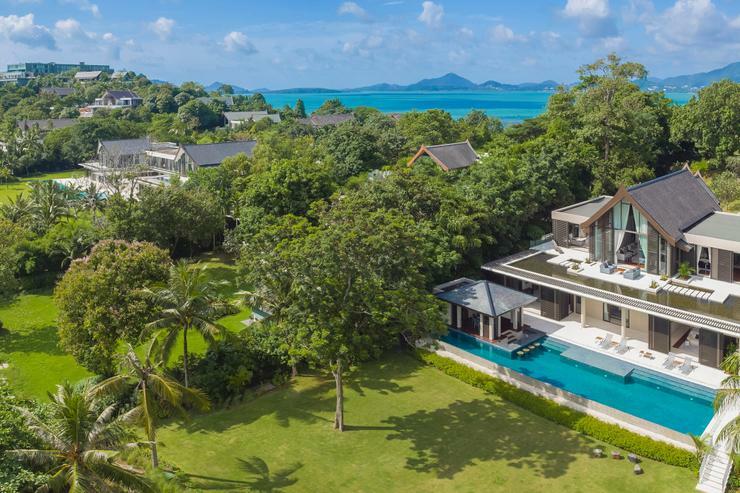 Villa Chloe is a in Thailand.